We've got a little less than 1 cup left of last year's homemade maple syrup. At this time yesterday, we had a little over 2 cups. If my sweet calculations are correct, we'll have just enough to tide us over until sugaring season comes around. If not, I'm in big trouble because we've already eaten the delicious proceeds from that missing cup of maple. I opened the bottle, eyeballed the pour into my copper candy pan, and put heat to our fancy amber. At 250ºF, I took the pot off the burner but left the sugar thermometer in place. Every 5 minutes or so, I checked the temperature and the second it hit 150ºF, I started stirring. Once the sticky mixture started to crystallize and looked pale, I transferred the gooey mass to a sheet of parchment, gave it a few pulls as if it were taffy, and left it to cool. Within 10 minutes, my little block started to look more pale. Within 45 minutes, it was cool and hard. 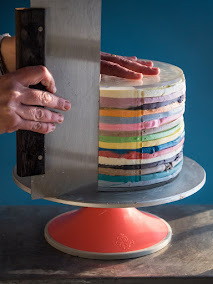 I took a chef's knife and cut the block into 1/4" irregular pieces. I nibbled at small bits as they flaked off the sweet block. 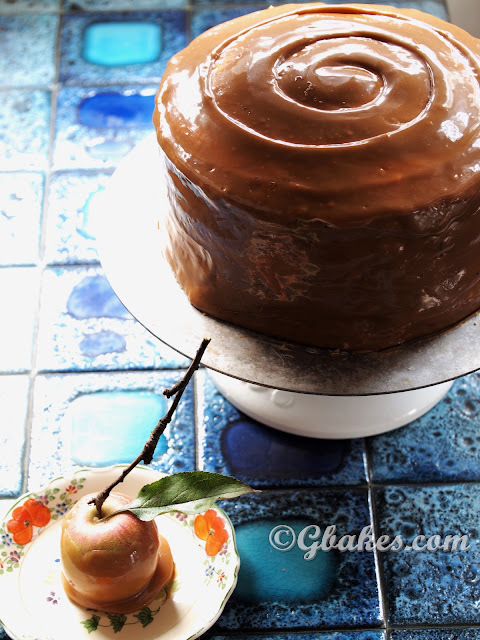 If you've had maple candy, you'd be surprised at the texture of this particular version. It's not the soft, slightly sandy confection that you get at specialty shops. It's harder. 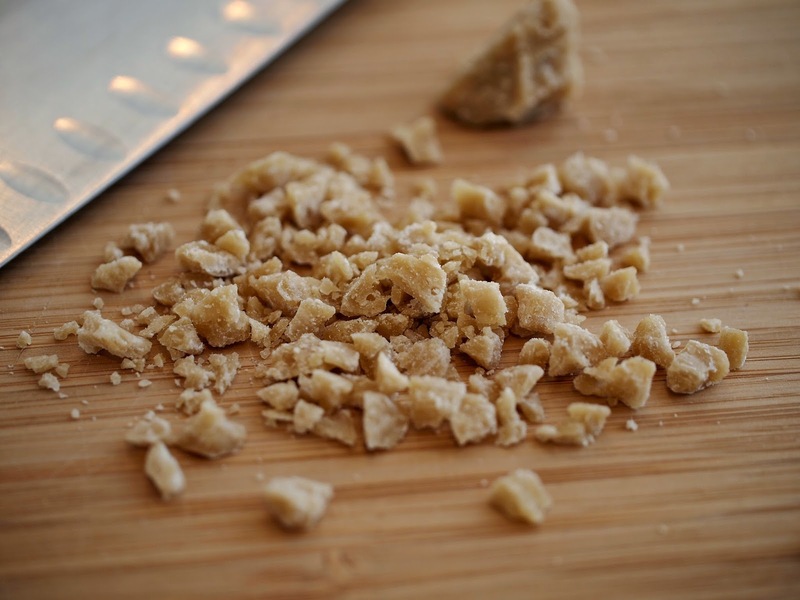 More like a rock candy but still crumbly and supple enough that it's easy to bite through. 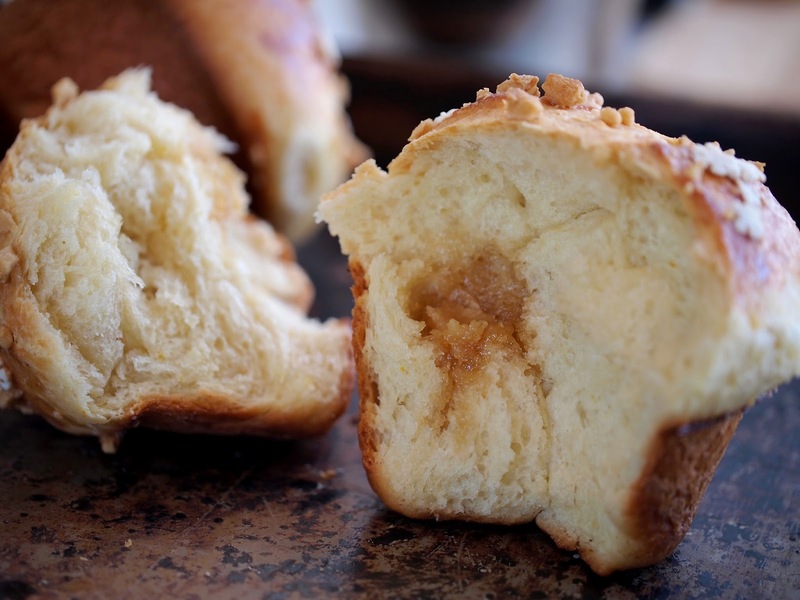 I hid my little jar of maple nibbles from myself and made a maple sweetened brioche dough. I've had this brioche plan in the works for months now. I've been calculating when I might drain off 1 1/3 cups of maple but still be left with enough to enjoy until the sap starts to flow in early spring. With outdoor temperatures dipping to -10, today seemed as good a day as any to enjoy a warm, earthy sweet brioche with pockets of crunchy sweetness hidden inside. In a small saucepan, combine the maple syrup and the salt. Add a candy thermometer and heat the maple syrup to 250ºF. To be technical, you want to bring the syrup to a temperature that equals 30 degrees higher than the temperature of boiling water in your area. At sea level, the temperature of boiling water is 212ºF. I've calculated the temperature in my house nestled in the Green Mountains to be between 219º and 220ºF, hence the 250ºF calculation. Watch the pot, the maple boils over quite easily. You can run a little butter along the edges of the pot to keep it from boiling over if you aren't going to be Johnny on the Spot. Take the syrup from the heat but leave the thermometer in place, don't stir just yet. Check the temperature of the syrup every few minutes and once it's reached 150ºF, stir. The syrup will have thickened quite a bit and will start to crystallize once you agitate it. This is what you want. Stir for a few minutes to encourage this crystallization and to aerate the candy, this takes a few minutes. Transfer the mixture to a piece of parchment paper and "pull" the candy and fold it over for a few minutes to aerate even more. Pat into a rough rectangle that's about 1/4" to 1/2" thick. Allow to set and cool, 45 minutes to an hour. Cut the candy into rough cubes and set aside. In the bowl of a stand mixer fitted with the hook attachment, combine the eggs, milk, maple syrup, and orange zest. Whisk to combine. In a small bowl, combine the flour, salt and yeast, stir to combine. Add the flour to the wet ingredients in the mixing bowl. Mix the dough on low until it comes together in a smooth ball but is still shaggy looking. Add the butter, a small knob at a time, continue mixing until the butter is fully incorporated. The dough should be slack and a little sticky but should still crawl up the hook a bit. If it's still primarily sticking to the sides of the bowl, add a little of the reserve flour, a tablespoon at a time, until the dough starts to come together. Mix until the dough is smooth and shiny, 15-20 minutes. Transfer the dough to a bowl sprayed with non-stick cooking spray. Spray the dough itself with non-stick spray and cover with plastic wrap. Allow to sit at room temperature for 1 hour or until it's just barely doubled in size and then refrigerate overnight. 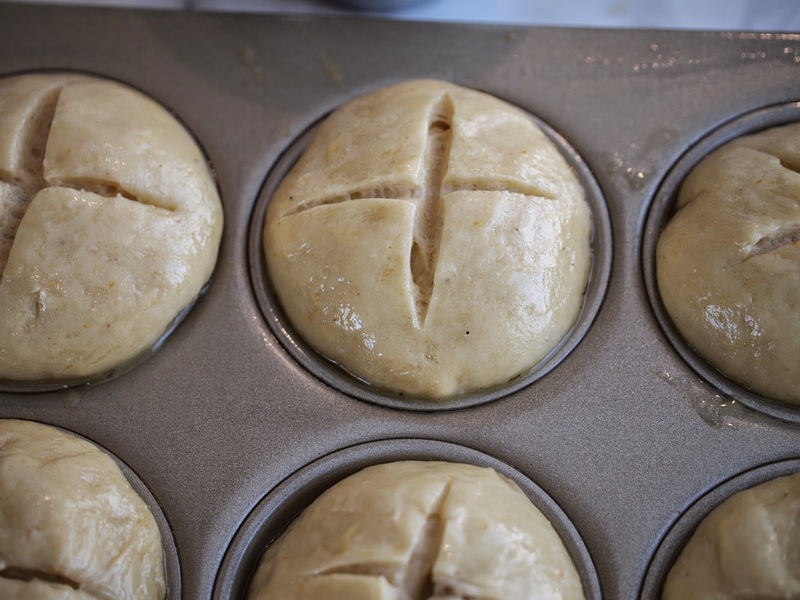 The next morning, divide the dough into 8 even pieces, weighing about 3.1 ounces each. 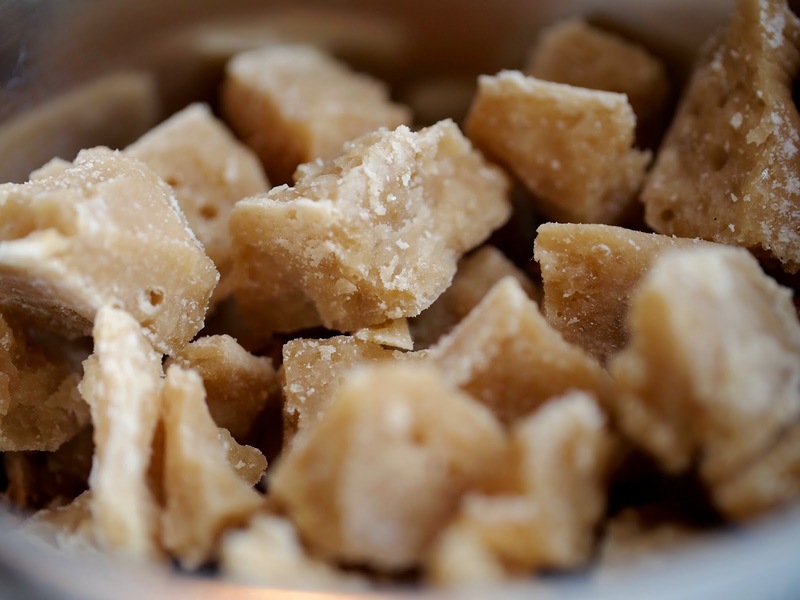 Gently flatten each piece of dough into a rough round and place 3 - 4 pieces of the maple candy onto the dough. You should use only a little over 1/2 of the maple candy. Fold the dough over the candy and pinch to create a pouch. 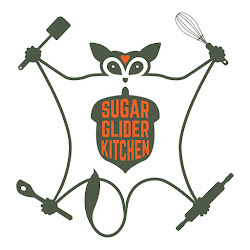 Turn the dough over, seam side down, and place your hand over the ball and make a little "claw" with your hand, with your fingers tucked under just slightly. Allow your palm to touch the surface of the dough ball and gently roll the dough in a circular motion to tighten the ball into a neat circle. Transfer the ball to a muffin tin sprayed with non-stick cooking spray. 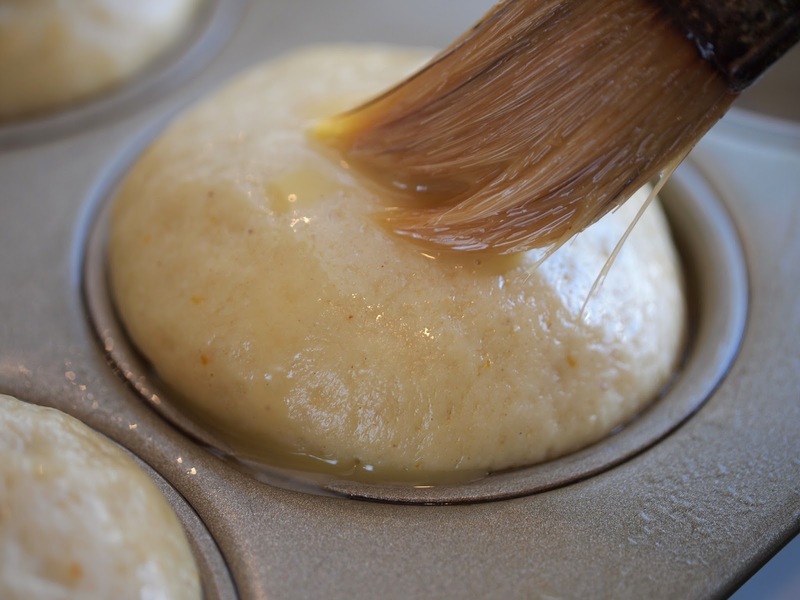 Continue with the remaining dough, spray the top of the dough with plastic wrap and cover the muffin pan with plastic wrap, tenting it slightly so that the wrap doesn't touch the top of the dough. Allow to sit at room temperature to proof, about 1 hour, until the dough starts to puff and slowly springs back when gently poked. Chop about 1/2 remaining maple candy into small bits, about half the size of a corn kernel. Set aside. You'll have extra maple candy for nibbling. It's likely that you've already done the nibbling, though. That's why I have you making extra...because I know you so well. 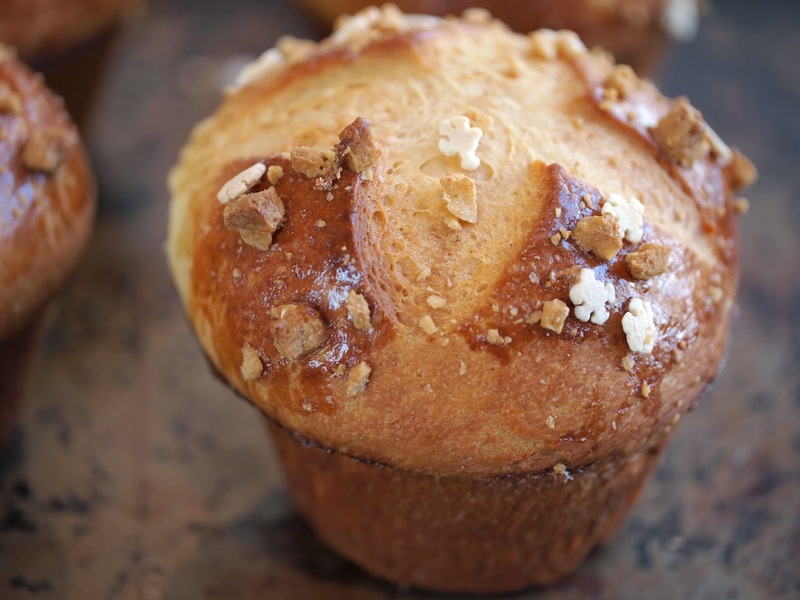 Using a pastry brush, brush the tops of the buns with egg wash. 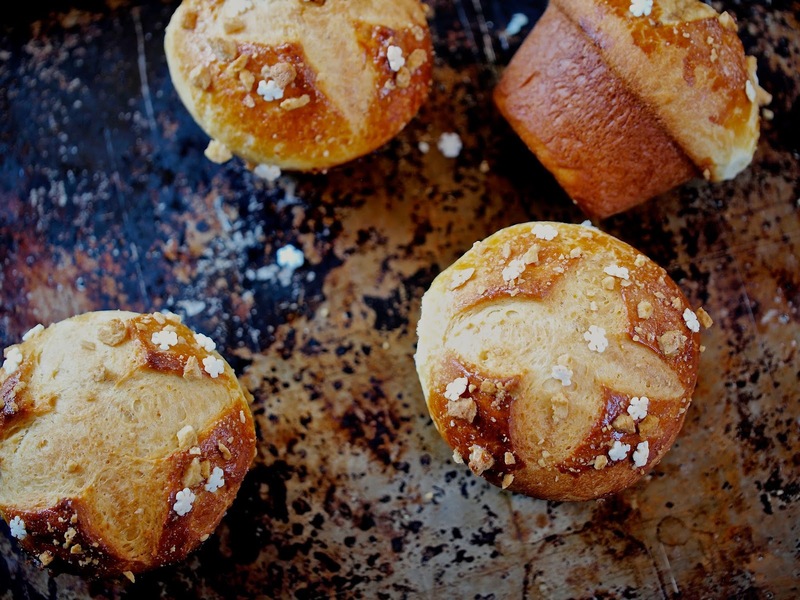 Using a razor blade or very sharp knife, cut a "+" onto the top of each bun. Sprinkle the tops with the chopped maple candy and a few snow sprinkles or a smattering of pearl sugar. 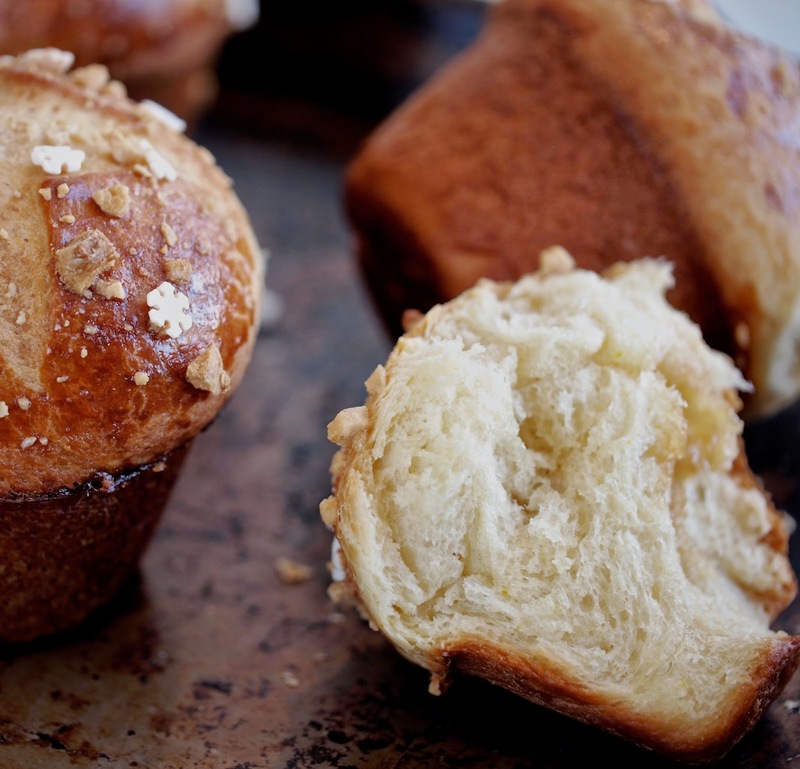 Bake for 15-20 minutes or until the brioche puffs and is deeply golden brown. 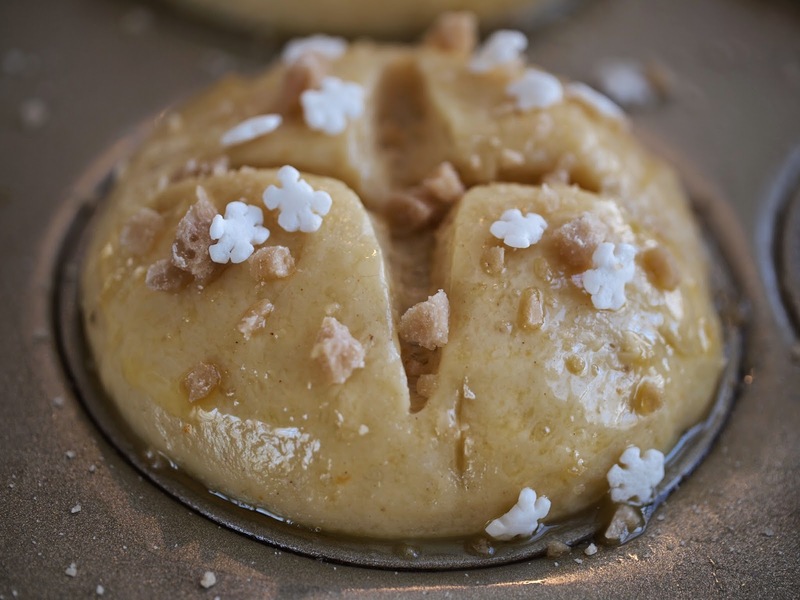 Serve still slightly warm (you want the buns a little warm but to have cooled enough that the maple crystals solidify just enough to give you a satisfying crunch when you take a bite) or allow to come to room temperature, cover well with plastic wrap, and freeze for up to a month.